I snatched some paint samples from the store and Voila! Instant tints! This uninspiring bulletin board was put together at the last minute. Didn't steal this one, surprise, surprise! Finally, this bulletin board is all my own, believe it or not! Each table has a circle in the center of the table with dots that tell them their number. The numbers correspond with the monsters on the all that tell them their job for the day. I have posted about this one before in a little more detail. So, I guess by now you have all found me guilty of stealing, but really, isn't that what we art teachers do best? We get inspiration everywhere. If I stole your ideas, please consider it the sincerest form of flattery and have mercy on me! I love the dots and the door sign. Wish I was allowed to tape stuff to my classroom door! 1) I LOVE your tree - the colours look amazing! 2) I have that same clock idea pinned too, it's a good one. 4) Thanks for posting. I feel inspired! How inspiring! 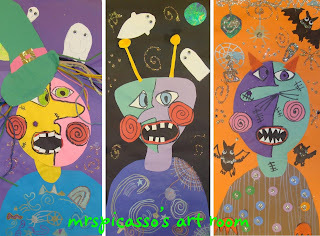 Your class looks absolutely amazing and like a fun place for the kids to be creative! Thanks for sharing. I am sure that I will use some of those ideas down the road. Its all so gorgeous..I've got to take a closer look! Life is about sharing..and art teachers are just the BEST about doing that! Thanks so much..happy new school year! WOW! What a beautiful and creative room! I wish you were my art teacher!! I do admit, I steal a lot from other art teachers, I wouldn't have survived these first years without their awesome ideas. I'm stealing the tint and shade idea:) LOVE all of your hard work! Whew! I am glad I have been pardoned. LOL. Thank you for all the great feedback. To Anne- my husband and son bought that Dali-esque clock at Hobby Lobby last year. The kids love it and always ask if it works. Um, yes! Haha! I'm so glad I found your blog!!! Thanks for sharing your "stolen" ideas! :) I may steal them too!!! But I think we should call it "sharing"---yes! You have a great blog here. Beautiful!!! How did you make all the circles?!! that must've been a lot of cutting. I want to take the clock idea, and the mess making art idea. :) Lovely room!! So cool! I'm going to steal all this and put it on my bulletin board blog. I believe as Art teachers - we're all thieves! But we do it to better our curriculum, environments, and to help our students grow as young artists. I myself have become addicted to Pinterest. I plan on stealing your idea and going "dotty" next year! I am a thief too, in fact, I "stole" one of your monsters to put on my consequence poster! I will have to take a picture so you can see him! Your art room looks fantastic. Well done! I feel so much better knowing I am not the only one stealing ideas! 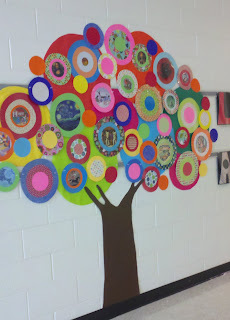 Using the circle tree idea on the door of my childrens art studio this week! Thanks for sharing! I really love the "Tinted" colors idea using FREE paint chips...I guess I'm a thief too, because I will be stealing that idea!! Thanks for all your inspiration!! your room looks great! I might have to steal the paint chip/tint idea (there's a theme with the comments, I believe.) Thanks for sharing! I love your room! so many ideas I want to steal! lol. I am a preschool teacher and art is my favorite thing to do! (I have often thought of becoming an art teacher) thanks for sharing! Oh my. I just read this wonderful post and got all jazzed up about it. Now I find that I saw this same post three weeks ago and commented on it then too! Wow, what is happening to my brain?????? I love this post though, evidenced by the fact that I fell in love with your ideas..........twice! How do I find you on Pinterest? Hi! LOVE your classroom! I am the maker of the tree in "London's colorful playroom" that you found on pinterest :) Trust me, I find it as flattery and NOT as stealing! I love it that you made the tree! Someone on Facebook saw this blog and pointed me to it so I could see. :) Just wanted to say hi! Way to be an enthusiastic teacher! Great work! How did you add the really cool social links at the bottom of your posts? I have the code for a simpler version, but I love the big icons! Love the way you've organized your classroom jobs. Being an art teacher must be the best job in the world! Looks like so much fun! I love the color wheel and tint/shade bulletin board. Where did you get the posters and decorative accents? Having the worst time finding a reasonable color wheel! Thank you! Constance, I am not sure where I got those color wheels! I have had them for awhile. If I happen to find the information, I will let you know! Love what you did!!! I am stealing the clock decoration!!! I can't remember how I found your site...I teach first aid to high school sophomores and I am going to steal your time flies clock idea...time flies when you're saving lives!!! I also make stained glass windows and recently made a 413 piece Starry Starry Night window...your shaving cream idea was great and also love the Laura Burch cats! Fantastic. Do you have room gor one more student? If this is, in fact, THE Peter H. Reynolds, then YES there is always room for you in my class! My daughter's school has a tree very similar to this on display in one of the main halls. 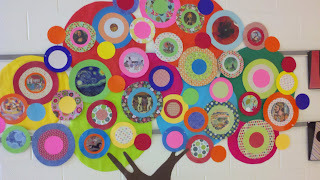 It is a collaborative piece of art (8 or so classes k-5) where each child made their own dot. It is of course based off of The Dot. Thanks for the great idea of the tree! I copied this & wrong BE on the tree and then had character traits on some of the circles & some left blank.